Surrounded mostly by water, the Florida peninsula juts into the Caribbean and separates the Atlantic Ocean from the Gulf of Mexico. Bordered to the north by Georgia and Alabama, about 11,800 square miles are covered by water. That's 18% of the state. What is Florida's maritime history? Once, Florida was about twice as large as it is today, but rising sea level has reduced its size. As a result, many of the coastal and riverine sites of the earliest inhabitants of Florida, from about 12,000 years ago, are now underwater and located mostly offshore in the Gulf of Mexico and in sink holes across the state. Florida's inland and coastal waters served as the area's primary transportation highway for over 6,000 years until the advent of the railroad and the automobile. First used by Native Americans, Spaniard Juan Ponce de Leon "discovered" Florida's waters in 1513. In the ensuing centuries, countless people in ships from around the world have passed through Florida's waters. Given the state's unique geological, geographical, and meteorological conditions, the seas can be treacherous. Vessels face many hazards, including strong currents, the Gulf Stream, reef systems, and hurricanes. 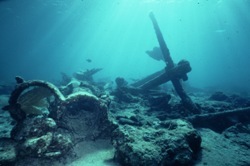 Consequently, a considerable number of shipwrecks lie off the coast of Florida. Each wreck is an individual time capsule that holds an abundance of information on life, commerce, and technology during the age in which the ship went down. In 1733, a 21-ship convoy of Spanish merchant vessels and warships sailing from Cuba to Spain was caught in a hurricane in the Florida Strait. The remains of 13 of the ships lie along an 80 mile stretch off the Florida Keys and make up the 1733 Spanish Galleon Trail. Florida has created a series of underwater archeological preserves featuring shipwrecks and other historical sites for visitors to enjoy. Underwater archeological preserves are marked by a bronze plaque and interpreted with a laminated site plan for self-guided underwater tours. Florida has created a Maritime Heritage Trail that highlights historic shipwrecks, coastal forts, lighthouses, historic ports, coastal communities and coastal environments throughout the state. The historic shipwrecks theme features 15 historic shipwrecks including many located in the system of underwater archeological preserves. Who takes care of Florida's underwater archeological sites? The Bureau of Archaeological Research within the Office of Cultural and Historical Programs is responsible for the state's historic shipwrecks and other submerged cultural resources on state-owned submerged lands. The Bureau employs a State Underwater Archaeologist and assistants who work with the public, sport divers, historical societies, universities, museums, and other groups in examining and interpreting submerged archeological sites. Given the thousands of miles of navigable Florida waters, only a fraction of the potential sites have been found, which means this team is very busy. What permissions do I need to study shipwrecks? Other permits required by state and federal law must be obtained before work commences. Should the applicant seek to dredge or fill as part of an operation, additional permits must be obtained from the Florida Department of Environmental Protection and the U.S. Army Corps of Engineers. Florida issues a limited number of contracts so it can closely monitor, supervise, and administer the activity associated with them. What laws are there about underwater archeology in Florida? The Florida Historical Resources Act is codified at Florida Statutes (2007) Title XVIII �� 267.011-267.174 and corresponding regulations may be found at Florida Administrative Code 1A. These laws and regulations emphasize that the state has a responsibility to administer and protect state-owned and state-controlled archeological sites and antiquities for the public's benefit. These protected resources include (but are not limited to) sunken or abandoned ships, engineering works, treasure trove, artifacts, or other objects with intrinsic historical or archeological value.